Are you amplifying your ROI data with a flexible attribution model? You’ve heard of single touch attribution, like first touch or last touch. Simple to execute, since you assign 100% of the credit for sale/conversion to either the first or last interaction/click. But what if you want a flexible attribution model, one that allows you to assign X% of the credit to the first interaction, Y% to the last interaction and distribute the rest of the credit amongst interactions in between, based on your own business logic? 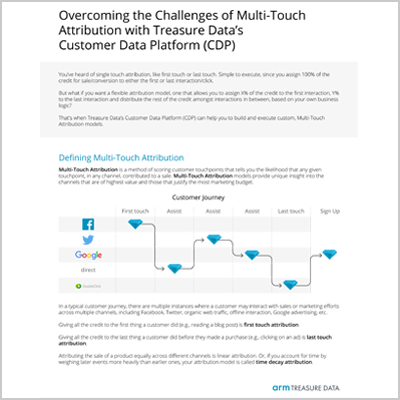 This guide explains building and executing custom, multi-touch attribution models in Treasure Data’s enterprise Customer Data Platform, providing multiple attribution model templates that are built as workflows to ease error handling and reduce end-to-end latency. This guide is sponsored by Arm Treasure Data.